“There is but one Paris,” said Vincent Van Gogh. And the more we travel, the more I believe he was right. Paris offers the world a menagerie of culture, art, food, architecture, and history, with unparalleled charisma. It’s been months since our trip to France with Eliza. Not a single week has gone by that she hasn’t said she misses Paris and wants to go back. I think about it often too. With spring slowly making her way into our valley (despite 6 inches of new snow last week), this seems the perfect time to tell you about our last few days in the City of Light. One of our favorite days in Paris was the day we explored Montmartre. We marveled at the neighborhood’s charm and history. We started with a short trek up the Butte Montmartre to Sacré-Coeur. Both Doug and I found this church to feel sacred, just as its name implies. We loved it for many reasons. Sacré-Coeur marks Paris’ highest natural point. It has a marvelous view. All of Paris fans out below you. It’s onion domes and bleached-bone color give the building an ancient appearance, but compared to most cathedrals in Paris, it is still in its infancy. It was completed only 100 years ago. The Roman-Byzantine basilica took 44 years to build. The exterior is laced with gypsum, which whitens over time, giving it that bright facade. Musicians can be found playing on the steps below the church. I will include some of their music in a video Eliza and I are putting together. A friend of mine, who teaches harp at BYU and graduated from Juilliard, saw this photo and told me that one of the most influential harpists in US History, who also taught at Juilliard, was French and played the organ for Sacré-Coeur during WWII. The building has a fascinating history. The church was built by Roman Catholics as a kind of penance that the surrounding neighborhoods had become divisive. Many were disgusted that their government had shot its own citizens (the Communards – who held out here in Montmartre after the French surrendered to the Prussians). Later, during WWII, bombs fell all around the church (see map above with pockmarks indicating bombs), but the church remained untouched. The only damage it sustained were a few stained glass windows that shattered during the blasts. Sacré-Coeur means Sacred Heart. This gorgeous mosaic, high above the altar, shows Christ’s sacred heart, open to all humanity. The Mother Mary is on his right. Joan of Arc on his left. Built by a French populace recently humbled by war, you can see the people begging for forgiveness. “To the sacred heart of Jesus, we are penitent and devoted,” it reads in Latin. Patrons today still pray for God to be understanding of the world’s sins. In all the chapels around Paris, I was struck by the repeated reverence and attention given to Joan of Arc. From the Basilica we made our way around the charming, winding streets of Montmartre. For hundreds of years, Montmartre has been a quiet escape from the busy center of Paris. It attracted monks who tended vineyards in the 1200s, farmers who ground grain with windmills in the 1600s, and Parisian liberals in the 1800s. A long list of beloved poets, artists, and dreamers lived here. They came for the cheap rent, the rustic landscape, and the chance to collaborate and support each other in their artistic endeavors. Artists’ Square is hopping with all kinds of color and original art, sold by the artists themselves. If you’re hoping to buy some art in Paris, wait until you’ve made it to Montmartre before purchasing. There are also some wonderful pieces inside shops along the various streets. We even found Mr. Van Gogh! In the flesh! 😉 And for 1 euro we had our picture taken with him. Liza has loved Van Gogh since 2nd grade. This guy is a pretty good likeness, wouldn’t you say? Later we stopped at his blue door dwelling (pictured further down), then a couple days later we spent hours at the Museé d’Orsay, taking in his art. It was the most fantastic full-circle journey! I paused here because. . . of course I wanted to eat in La Mère Catherine! (The Mother Catherine.) A cafe named after moi! 😂 And even with the correct spelling! But look at that fellow’s face?! . . . I turned and kept walking. Okay friends, listen up! We tried a lot of maracóns in Paris. And I know everyone loves Ladurée macaróns — on the Champs Elysée. And they were good. But I have to tell you, this Biscuiterie on Rue Norvins was unmatched. You MUST find this place if you are in Paris! We tried a bag full of flavors and EVERY SINGLE ONE was amazing. I’ve never tasted a better macarón! Thanks to my lovely friend, Jill, for the tip. This cobblestone street had a mural with a timeline of Van Gogh’s life. This is the only existing vineyard on the Butte today. Vineyards like this, along with wheat fields and windmills, drew artists out of dirty Paris, into these quiet streets. Just down the hill from the vineyard, you will find La Maison Rose, “The Pink House,” made famous by a Utrillo painting in 1916. It was frequented by Utrillo, Picasso and Gertrude Stein. We hear the food isn’t so great, but it’s lovely eye candy. Continue down to the intersection and you’ll find the village’s hot spot — Au Lapin Agile Cabaret. Artists like Renoir, Utrillo, and Modigliani, would gather here to perform parodies, read poetry, and (with a cue from the rabbit), drink. Next stop for us was Picasso’s studio – Le Bateau-Lavoir. This humble little spot marks the place were modern art was born. Here, as many as 10 artists lived and worked. It earned the nickname of “the laundry boat” because the facilities were so crude it would sway and creak. In 1904, a Spanish immigrant named Pablo moved in. He met Fernande Olivier, his first girlfriend, who lifted him out of his melancholy Blue Period into his rosy Rose Period. Next up? Van Gogh’s House. Vincent lived here with his brother from 1886 – 1888, on the top floor. It was during these two years that Van Gogh transformed from a dreary Dutch painter, to an inspired visionary with novel ideas and bright, impressionist colors. It was absolutely amazing to me to think of all these struggling artists, who had no idea of the fame that would come to their work one day. I was moved by the stories of them gathering, talking, inspiring each other, trying to help each other become something — how impressionism was literally born in these tiny living spaces. Eliza ate a chocolate eclair every day. Sometimes multiple eclairs a day, trying them at every patisserie we entered. This one she grabbed at one of the best treat stops in Montmartre — Gilles Marchal. And our last stop in Montmartre? Moulin Rouge. We came, we saw, but we did not go in. 🙈 😂 I was super tempted to do the can-can right there on the corner. Look! That lady’s ⬆️ got it goin’ on! We followed Rick Steve’s Montmartre Walk (which I highly recommend) and did all of the walk in one morning, but you could spend much more time there eating and shopping if you’d like. In the afternoon we toured the Louvre. First thing we noticed was this relief work of the Sun King, Louis XIV. Reminiscent of our day in Versailles. The Apollo Gallery, where the crown jewels are housed, was absolutely stunning. Le Louvre used to be the principal residence for kings and emperors of France, and the word “louvre” means castle. This is the crown of Louis XV. It has a 140 carat diamond! Say what? In the painting above, Francis is contemplating Christ’s crucifixion. Jesus then comes to him and shoots light (looks like lasers) out of his hands and feet into the hands and feet of Francis, marking him with the stigmata. I read that after this experience, Francis went on to “breathe the spirit of Renaissance into Medieval Europe.” He had a humble love of man and nature and inspired many artists during that time. Giotto wanted to portray real human beings with real emotions. Isn’t it interesting though that medieval art had trouble conveying dimension and line of sight? Francis isn’t quite looking at Jesus. This is Nike, the Greek Goddess of Victory. Crafted around 200 B.C. (so OLD!) It was created to convey victory during a sea battle. Here she is alighting the prow of a ship, her clothing wet and draped, the wind pressing aginst her. 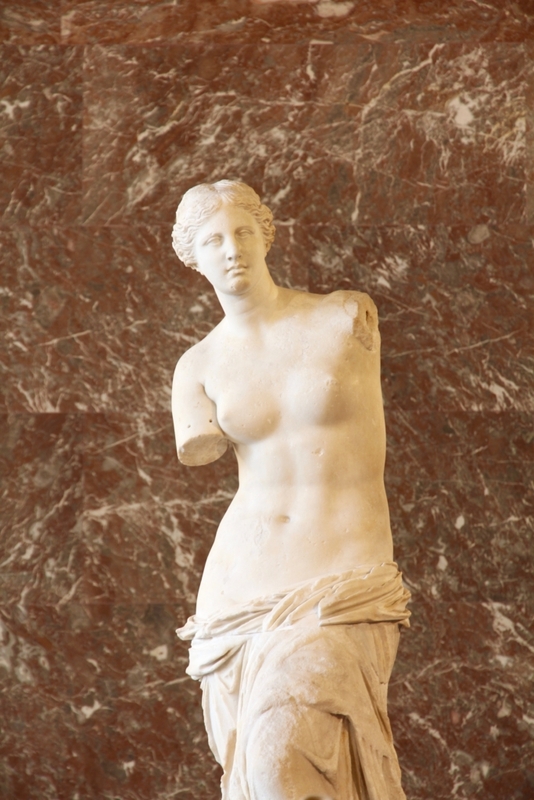 Her right hand, with one finger extended (like we’re #1) was later found and can be seen in a display near the statue. It was so much bigger than I thought it would be. I couldn’t get over the heavy, wet look of the stone, the grandeur of it, the courage in her stance. It is simply awe-inspiring, triumphal. Beautiful view of the Louvre plaza from a window inside the Louvre. And this!? This is the Mona Lisa fan club. All crowding in for a photo. We pushed and jammed our way through the crowd to take a quick pic, then moved on. Later we read all about Mona and how she was a gift for the King of France. La Joconde. My Lady Lisa. Painted 1503-1506. Francois the 1st invited Da Vinci to Paris and Leonardo brought with him a portrait of Lisa del Giocondo, the wife of a Florence merchant. Francois fell in love with the painting and called it La Jocund — a play on her last name and the Italian word for happiness. Sfumato blurs the lines of her mysterious smile so you can’t really tell if she’s happy, sad, tender, or cyncial. Not sure what we saw more of in the Louvre — greek statues, or people taking selfies. Here we have both: Apollo. Taking a selfie. I’m sure we weren’t the first to come up with this photo op. Of all the paintings we saw during our afternoon in the Louvre, this one impacted me the most. 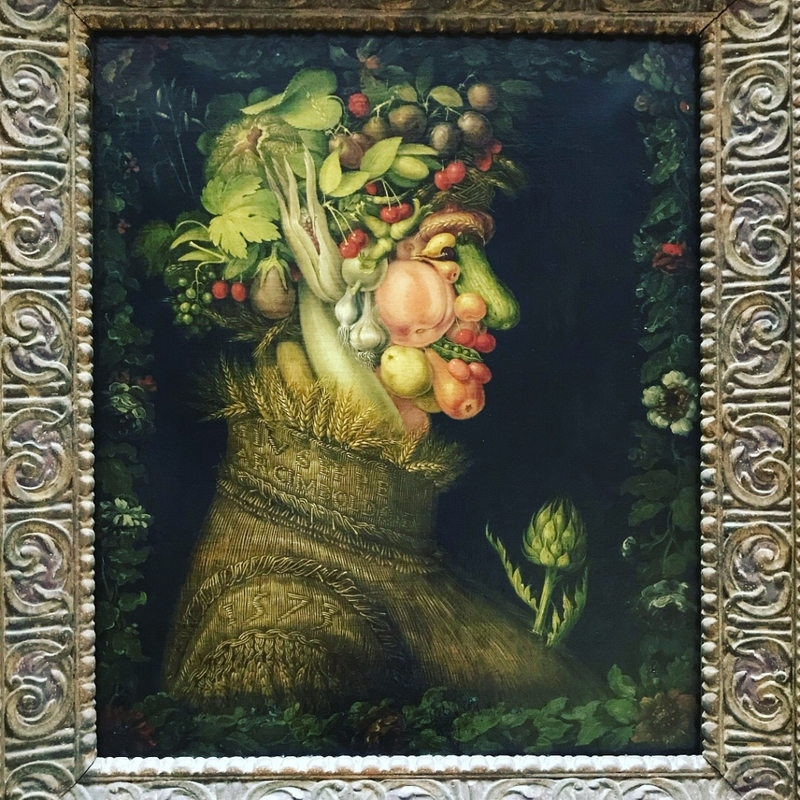 We saw Venus de Milo, Michelangelo pieces, Vermeers, Acrimboldos, and Delacroix — all of which I loved — but there was a spirit in the Rembrandt room I could not dismiss. I could not believe we were seeing the canvases these hands and brushes, both divine and inspired, created. 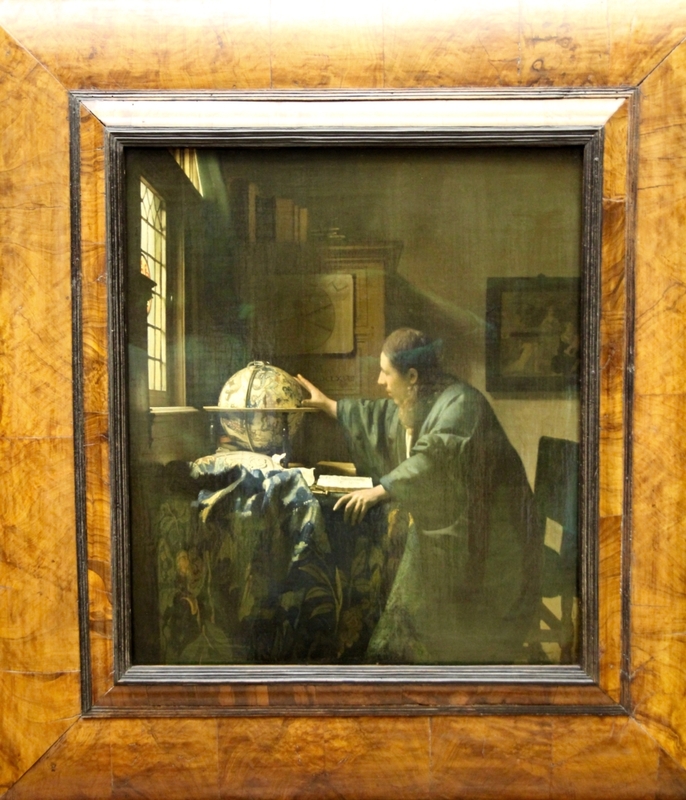 The Astronomer, by Vermeer, 1688 / Summer by Acromboljdo, 1563 / Venus de Milo (Aphrodite), Alexandros of Antioch, 101 B.C. It was a long day of walking. So we stopped before leaving the Louvre to stretch. 😂 Eliza wanted to ride on every escalator she saw. You know. . . less walking. And I think the Louvre did her in. This was day 5 in Paris. It was 12:15 PM and she was still zonked! The time change and a non-stop itinerary finally caught up with all of us. Doug and I slept in past our usual wake up, but we could not rouse Eliza until about 1! So that afternoon, we took it easy — did some shopping, eating, and lounged at the Jardin Luxembourg. The sailboats, one from every country, were so much fun. So much sunshine. And the flowers were gorgeous! These are the famous chess players. Can you see Doug making his way through? We sat and watched them for a while. Side note: Secco, just off the metro stop for Jardin Luxembourg, was our favorite patisserie. We thought they had the best kouign amanns and almond croissants! Paul’s is a good too — and they’re everywhere. But let’s be honest, there are boulangeries on every corner, and really, it’s hard to go wrong! The only meal we ever stopped for was dinner. The rest you can find on the street and eat as you go! After the gardens, we walked to the Pantheon. Unfortunately, it was closed for renovation. It was modeled after the Pantheon in Rome and was a place for King Louis to house all the patron saints of Paris. Constructed 1758. Another stop for gelato at Amorino. Honestly, don’t go anywhere else. You’ll find an Amorino in most areas and their ice cream is the best! The next day we went to church in the morning. Sadly, we ended up in the visitors’ meeting and weren’t able to rub shoulders with Parisian Saints. Still, a good experience. Then we headed to the Orsay. Trains used to run right under our feet here. This old train station barely escaped a wrecking ball in the 1970s when the French realized it would be a great place to house all the 19th century art scattered around the city. And my goodness, what a treasure it is! This was absolutely my favorite museum, with all of my favorite artists! After walking through Montmartre, and the Louvre, it was amazing to walk an art timeline through the Orsay, bringing us right into the 20th century. Ground floor is early 19th century — stuff you would have found in the Academy and Salon, followed by some Realism works. Here you find both conservatives and rebels. Those who pushed back against the Salon with their works. Toulouse-Lautrec, Daumier with his political cartoons and caricatures. Millet, with his departure from idealized gods and goddesses to simple, rural scenes. The top floor is where you’ll find all the Impressionist rooms. If you’re short on time, zip right up there! I read once that you don’t hang an impressionist canvas — you tether it! So much light, color, spontaneity, and movement! These artists started a revolutionary technique. They didn’t blend their colors; instead they brushed one color over another, and when you stood back to take in the painting, you would see the color of intent, plus a shimmer of several other surprising colors. It was magical. Bedroom in Arles. Van Gogh. First stop for us was Van Gogh. Look at those broad brush strokes. Can you see the technique at work? I had to bring the lens in close to capture this incredible piece. Ahhh, the real Van Gogh! Walking through these rooms was a reverent experience for me. So many times I have written on note cards with these images, flipped through books of these works, scribbled onto my appointment calendar opposite one of these featured paintings. The impressionists captured nature so beautifully with their open-air scenes, their bright but easy-going colors, the way they played with light. Their works always transport me, fill me. Le Déjeuner sur l’Herbe by Monet. This is part of three fragments from a 4×6 meter painting he started in 1863 called Luncheon on The Grass. It was a response to Manet’s painting with the same title which had received widespread criticism. But Monet gave it to his landlord because he could not pay his rent. The landlord rolled it up and it became moldy. Several pieces have been restored but the third fragment was lost. Monet experimented with urban scenes, but he was most at home in the countryside. Two regrets: I wish we’d had time to visit his garden and home in Giverny. And I wish we’d had time to see his water lilies at the Organgerie Museum. Another trip I suppose! I have been a Degas fan as soon as I was old enough to know his dancer paintings existed. Partly because I was a dancer. Partly because his color choices are exquisite. Partly because he painted informal scenes. The Ballet class by Edgar Degas. 1874. Class being taught by ballet master Jules Perrot. Degas blended classical lines and Realist subjects with impressionist colors. He had a sort of “snapshot” effect with his art, as if he had quickly peeked in on an intimate scene. Monet. The Garden of the Artist at Giverny. Le Jardin de l’artiste é Giverny. Van Gogh. Starry Night over the Rhone. Gaugin. From his time in French Polyneisa. Paul Cezanne. Pommes et Oranges. Doug has a great love for art. While I snapped photos, he toured Eliza around and taught her about these men’s lives and styles. Feeling so grateful these works were right in front of me, I had to zoom in on a few signatures. It was breathtaking. All of it. And I could have stayed several days. We loved the clock window. Can you the Paris Eye through the glass? Liza silhouetted on the left. And here is the Tuileries garden, as viewed from the balcony of the Orsay. After the Orsay we sneaked into the Rodin Garden, just before it closed. I wish we could have seen more, but the statuary garden was incredible. Le Penseur. The Thinker. Look how every muscle is tensing. This is a man considering his fate. Examining his choices. And it is intentional, I believe, that leading away from him, are a multitude of paths. Like spokes on a wheel. So many options. So many ways to be. Rodin loved overgrown gardens and joyed to put his creations in flourishing green places. These are the Gates of Hell. Inspired by Dante’s Inferno. “Abandon all hope, ye who enter here!” Dante’s trip into hell urged Rodin to explore the darker side of human experience. Don’t look too close. It’s troubling to be sure. Notice the Three Shades of hell on top, pointing where they are going (or where we are going?) with Dante, posed as The Thinker, below. I find it interesting that Rodin actually described The Thinker as a statue of himself. This photo shows the beauty of the rose garden and the proximity to the Eiffel Tower. Sunday night, we attended a concert at Saint-Chapelle. Our dear friend, Bob Stephenson, who is a fabulous organist, suggested we splurge and make this happen. This was one of the best tips we were given. It ended up being one of the top highlights (if not THE highlight) of our trip. Tickets are not cheap. But it’s completely worth every penny and you will want to purchase your seats right up front. This evening’s concert happened to be The Four Seasons by Vivaldi. One of Doug’s favorite works. It was performed by a small chamber orchestra, with Frédéric Moreau as concertmaster and solo violinist. He is one of France’s most prolific musicians and has performed all over the world, including Salt Lake City, with he told us about when we spoke with him after the concert. He had every measure memorized. He was flawless. He played and conducted without a single sheet of music in front of him. He was enchanting to watch. The music was so elevating. Evening light streamed in through the rose window and all the stained glass vibrated with color. We felt like we had transcended mortality, levitated off the earth for a time. I’ve never seen such passionate playing. The hour went far too quickly. We floated out of the chapel, sun sinking low over the Seine. We laughed out loud at how magical the whole experience was and walked towards Notre Dame to find our trusted crépe cart. Bananas and nutella. The best. As the sky took on a pink hue, we watched the sun set and the riverboats go by. It was a truly dreamy evening. Government building. French flag in lights. Our last day in Paris, we bought gifts for family and friends at home, returned to a few places where we hadn’t had enough time. Like this bookstore. If you are a reader and book lover, you will adore this nook of a shop on the Left Bank. No pictures are allowed inside, but from a window upstairs you’ll find a spectacular view of Notre Dame. Over the years, struggling writers have been given accommodations in these tiny rooms with a view, in an effort to offer inspiration. Writers such as Hemingway, George Bernard Shaw, and Ezra Pound stole away here. The Seine. Saint-Chapelle steeple in background. Our last night we walked through the Tuileries Garden to the Place de la Concorde, where we rode the Paris Eye. I love that in both photos of the swings, the French Flag is unfurled and flying. From the Eye, we could see the entire City of Light. ✨ Sacré-Coeur on the hill. From there we walked back to the Eiffel Tower to watch the light show twinkle on one last time. This magical city, with all its history, its centrifugal mecca of world happenings, its art, its literature, its layered architecture and lovely people. It’s spell-binding. I felt like everything I had learned over the years in books, classes, music, museums, movies — all of it started to fit into one ginormous puzzle. Piece after piece. Until I could see a whole realm of knowledge as one integrated, connected masterpiece. It was an unforgettable gift. Touring this place with Doug and Eliza. Thank you Doug for making her dream come true. And mine. Je t’aime. Au revoir belle Paris! En attendant de nous revoir! Adri, I have never heard that story!! So funny! 😂 Thank you for sharing! I will tell Eliza. Hope you are well and beginning to find spring in your mountains. Love you! !